From plenty of interior space to your choice of powerful engines, the 2017 Volkswagen Jetta has a lot to offer. Starting with this model year, all trim levels of the Jetta come standard with a rearview camera. It also offers several driver assistance features on lower trim levels and adds a USB connection to the infotainment system to replace the old-school cable connection. Worth noting too is that the Jetta Hybrid is no longer available as of this model year. The Jetta is a front-wheel drive car that offers buyers a choice of three different engines based on trim level. The base S and SE trims come with a 1.4-liter turbocharged inline four-cylinder engine that is capable of 150 horsepower and nets 184 pound-feet of torque. Standard for this engine is a five-speed manual gearbox, but you can order the optional six-speed automatic. The manual version gets an EPA-estimated combined 32 mpg, while the manual gearbox offers and estimated 33 mpg combined. The SEL trim comes equipped with a 1.8-liter turbocharged inline four-cylinder engine that produces 170 horsepower and 184 pound-feet of torque. This engine comes mated to a six-speed automatic transmission as the only choice. It is rated at an EPA-estimated 29 miles per gallon combined. At the top of the scale is the GLI version with its turbocharged 2.0-liter engine that is rated at 210 horsepower and 207 pound-feet of torque. This one comes with a six-speed manual gearbox, but you can choose the optional VW DSG dual-clutch six-speed automatic transmission. Fuel economy ratings are 27 mpg with the automatic and 26 mpg with the manual gearbox. The inside of the Volkswagen Jetta eschews the sharp edges and tight shapes seen in many of today’s cars in favor of a more traditional look. However, it definitely offers plenty of the latest technology for you to enjoy. There are two infotainment screen sizes to choose from, 5-inch in the lower trim and 6.3 in all others. All systems are designed to integrate fully with Android Auto and Apple CarPlay. 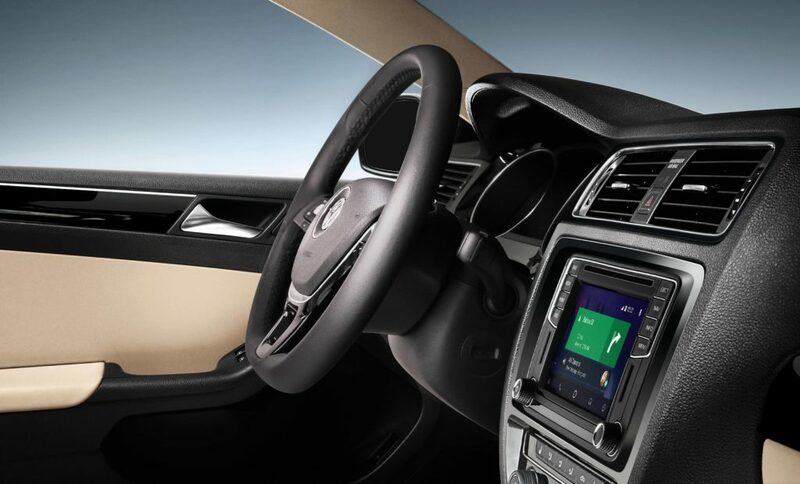 SE and up trim levels include satellite and HD radio along with the VW Car-Net App-Connect range of connected services. Step up to the GLI trim and get a premium Fender audio system complete with 9 speakers and a subwoofer. Not only did VW add a USB connection, but the system is capable of playing FLAC-type music files. Safety features include active front head restraints, blind spot monitoring, rear cross-traffic alert, and forward collision warning with automatic emergency braking. With its choice of powerful engines, roomy and comfortable interior, and 13.5 cubic feet of cargo space, the 2017 Volkswagen Jetta makes an excellent choice for a wide range of car buyers. To take yours for a test drive visit the VW specialists at Durham Volkswagen or call us today at (919) 493-7411 to schedule your test drive today. Or simply come on in and see us in person; our friendly sales team is waiting for you.